Gorgeous single bed complete with mattress. Ideal choice for children's, teenagers and spare bedrooms. Traditional hospital style with a nostalgic appeal. 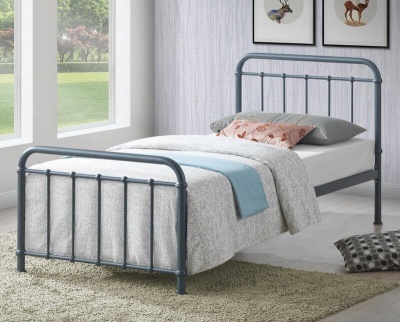 Combine with crisp white or floral bedding to add to the charm and magic of this nostalgic metal bed frame. The sprung slatted base adds comfort and prolongs the life of your mattress. Choose from the Premier or Deluxe mattresses. Premier single mattress. High quality materials have been used in this mattress. 18cm deep coil sprung mattress with medium firmness. The cover is made from damask material. Ideal for chidren's or guest use. Deluxe single mattress: Semi orthopaedic. 23 cm deep open coil with medium firmness and a soft damask cover. These mattresses conform to UK fire flammability regulations. Care instructions: Turn mattresses regularly - do not bend or fold. The dimensions of the Premier mattress are: D18 W91.5 L190 cm. The dimensions of the Deluxe mattress are: D23 W91.5 L190 cm. Bed frame colour: Stone white which is an off white colour. Eggshell textured finish. Delivered in two boxes plus a plastic wrapped mattress. Part of our collection of metal bed frames.